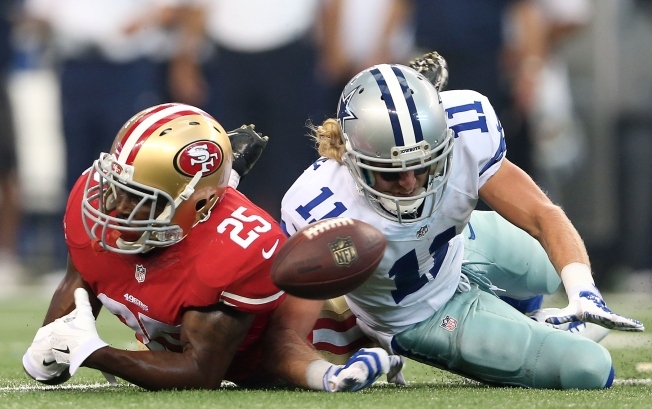 There is plenty of blame to go around for the problems of the 49ers the past two weeks. In losing consecutive games to the Bears and the Cardinals, the 49ers have committed too many penalties and made too few plays -- on offense or defense -- in the second half. So far, the 1-2 49ers have been a Jekyll and Hyde group, playing very well in the first half of games and then giving way to their evil twin over the final two quarters. Bill Barnwell of ESPN’s Grantland took an in-depth look at the Niners’ woes and pointed out that the offense’s third-down conversion rate has plummeted from almost 70 percent to 45 percent in the second half, while the rushing attack also has been less successful, going from 4.9 yards per rush to 3.5 yards in the third and fourth quarters. Wide receiver Anquan Boldin threw some of the blame for the second-half woes on the officials and the fact they’ve called some crucial penalties on the 49ers in the second halves of the past two losses. “They wear black and white,” said Boldin of those responsible for his team’s woes. But Barnwell has a different theory. In the second half of both losses, to the Bears and Cardinals, rookie safety-turned-nickel cornerback Jimmie Ward has been victimized. He gave up three touchdown passes to Brandon Marshall in Week 2 and also a TD to rookie wideout John Brown in Week 3. Meanwhile, cornerbacks Chris Culliver and Chris Cook “have been bad this year,” Barnwell wrote. So, when the 49ers have gotten first-half leads the past two games, the Bears and Cardinals have attacked a San Francisco secondary that appears to be far less effective in 2014 than it has been in recent seasons. As the 49ers prepare to host the 3-0 Eagles Sunday at Levi’s Stadium, the 49ers secondary is going to have to get much better very fast. Ward will have to learn from his mistakes quickly or Chip Kelly’s high-powered spread offense is going to go after Ward, Culliver and Cook without mercy. A return to the running game and converting third downs in the second half will go a long way toward controlling the football Sunday. It also will keep the ball out of the hands of Eagles quarterback Nick Foles, who no doubt has been studying the mistakes of Ward & Co. the past two weeks and eagerly awaiting his chances to exploit them the way Jay Cutler and Drew Stanton did the past two weeks.